KT Assemblies Ltd. was formed in 1985 to fill a gap in the market for specialist bespoke electronics for the security industry. From the early days of manufacturing security power supplies the company has diversified into manufacture of a variety of items for the security market. Not only do we manufacture ac/dc power supplies, special control panels and door control systems, we can also now offer a wide range of ancillary items such as timers, door alarms and repeater displays. As a UK manufacturer of security supplies, our range of security parts and components is second to none. One item very popular is our Push to Exit switches, which can be incorporated into various door security systems. 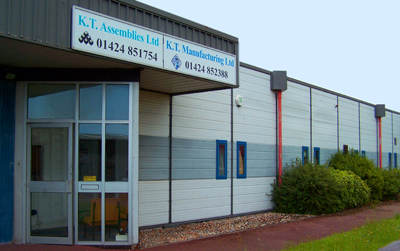 KT Assemblies Ltd. offers a custom design PCB service, screen printing, engraving and custom metal work services. If you are in a hurry that is not usually a problem either. We endeavour to meet your delivery requirements wherever possible, and a next day delivery service is available on many items. Should you require a special product not listed please do not hesitate to call so we can provide you with a quotation. We manufacture a full range of special enunciator panels, personal attack panels and multi-zone door monitor controls. Door interface interlocks and floor plan indication panels. We can undertake all kinds of screen printing, engraving and metal work, also wet and powder coat spraying. Due to the expansion of our auxiliary security products and the shortage of space at our premises at Unit 10, we have opened a new factory dealing with this side of our product range only. We have divided the company into two separate units, K.T. Manufacturing Ltd and KT Assemblies Ltd..
KT Manufacturing handles our Security Camera and Security Monitor spraying or any other security ancillary items, many of the customers we have spoken to were unaware that we offered this service, and have mentioned finding it difficult to source this kind of facility. We are happy to take delivery of your free issue products. We will dismantle and mask where necessary and professionally spray the products to your chosen colour. This service is available on both plastic and metal items. If you gave any questions or special requirements please contact us.